F G Davis, Matchbox Series. The matchbox series was begun in 2013. I used old matchbox covers as a starting point for these pieces. The covers themselves gave me ideas as to the design of these small canvases, sometimes colour choices, sometimes images, but often both. The idea of giving old graphic and typographic design a contemporary treatment made the project an exciting one with lots of new possibilities. So far there are 32 paintings in this series. Matchbox series 19. Gateway Matchbox and Acrylic on Canvas.2013. This painting uses the Gateway label as a starting point for the design. The Camp matchbox is used as a basis for this image. The colours of the original matchbox inspired my design choices. Matchbox Series 29. 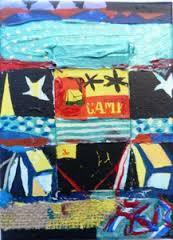 Arthur Cooper Matchbox and Acrylic on Canvas. 12.7x17.7x1.5cm. 2014. The guardsman on the matchbox cover led to the choices of colour and composition. Matchbox Series 22. Sunshine Matchbox and Acrylic on Canvas. 12.7x17.7x1.5cm. 2014. All the colours of a sunshine day. Th e colours on this canvas are indicative of fire.